CHARLESTON, S.C. — At the National Philanthropy Day Luncheon at Gaillard Hall, the SC Lowcountry Association of Fundraising Professionals presented Coastal Expeditions as the 2018 Small Business Philanthropists of the Year. Nominated by the Avian Conservation Center and supported by Lowcountry Land Trust, Coastal Conservation League and Friends of Coastal SC, this award was given to Coastal Expeditions as recognition of their support of these and other local environmental non-profit groups. Coastal Expeditions works with regional non-profits on projects that are important to the health our community. 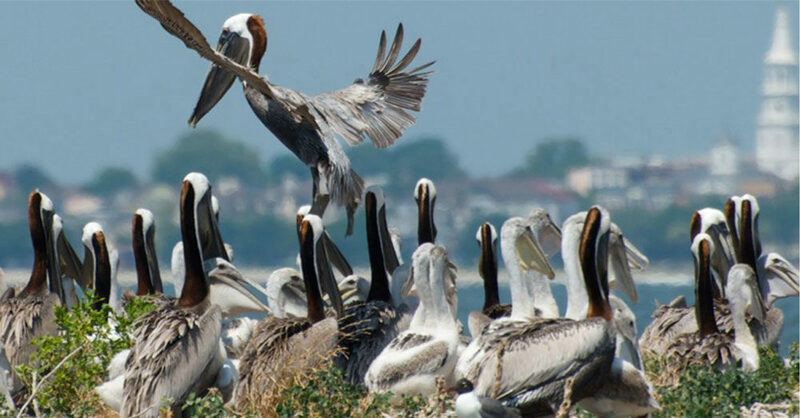 A 2018 initiative is the campaign to raise $1.4 million for the re-establishment of Crab Bank Seabird Sanctuary in Charleston Harbor. This was the first time that an award has been given to a small business. Other individuals and organizations that were recognized at the luncheon were Elliot Demerall, Ragina Scott-Saunders, Bishop-Gadsden Episcopal Retirement Community, Nucor Steel and Martha Rivers Ingram. The Coastal Expeditions Foundation is a nonprofit organization founded in 2018 dedicated to conservation and environmental education in coastal South Carolina. Formed as the philanthropic arm of the outdoor outfitter Coastal Expeditions, Inc., its mission is to connect people with our natural areas and to support other non-profit groups with environmental missions through fundraising, volunteering and in-kind donations.